Tracy Abrahams : Thank You Cards using Cottage Greetings by Stampin' Up! Thank You Cards using Cottage Greetings by Stampin' Up! I needed to make some quick thank you cards and I love the "thanks" sentiment from the Stampin' Up! set Cottage Greetings so i reached for that and decided to make a few in the new lovely In Color from Stampin' Up! I first cut the whisper white card stock into 20cm x 10cm scored down the middle to make 10cm x 10cm squares. I made a mat with the In Color card stock of 9.5cm x 9.5 cm and then put whisper white on top of 9cm x 9cm. 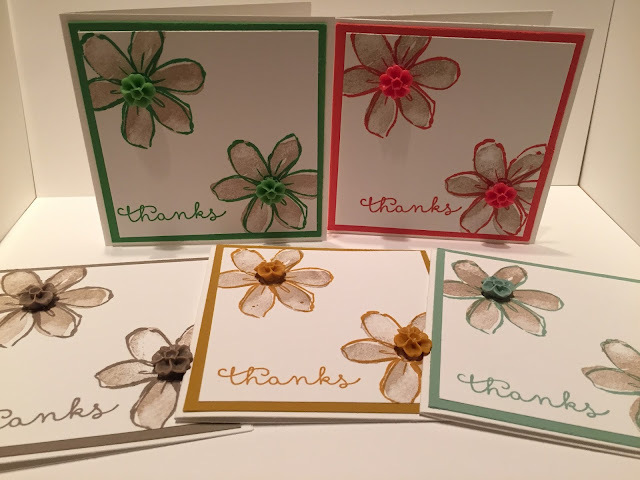 I used the lovely flower from the Garden in Bloom stamp set and stamped in each In Color to co-ordinate with the card stock and used crumb cake to stamp in the shaded area of each flower. I used the super cute In Color Blossom Accents in the centre of each flower to co-ordination, and finished the card off with the lovely Thanks sentiment from the Cottage Greetings stamp set. Super quick. I hope you like them and, I have added the supply list here.